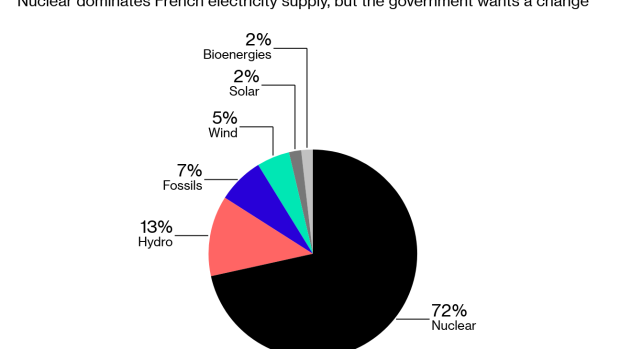 (Bloomberg) -- The French government is considering buying out minority shareholders of Electricite de France SA, the first step in a corporate restructuring to address the challenge of replacing the country’s nuclear-power backbone, people familiar with the matter said. The government has asked EDF, of which it owns 84 percent, to propose changes in its structure. The utility’s cash flows are vulnerable to volatile power prices and intensifying competition and it’s already struggling to fund billions of euros of investments to maintain or replace its aging reactors. The company is expected to submit its proposal to the government by July, another person said. The government could buy out the shares it doesn’t already own -- which currently have a market value of about 7 billion euros ($7.9 billion) -- at a cost of about 8 billion euros, the person said. The state could subsequently recoup part of its investment by selling a minority stake in EDF subsidiaries that wouldn’t include the nuclear assets, the person added. EDF and the Finance Ministry declined to comment. Last November, President Emmanuel Macron said EDF would halt up to 14 reactors by 2035, with the aim of reducing nuclear power to 50 percent of the electricity mix from 72 percent currently. He delayed a decision to build new atomic plants until at least 2021 and presented plans to boost wind and solar. The president also called for a new regulation of EDF’s nuclear power prices to keep electricity bills under control amid weekly protests against energy costs and taxes. France will review its shareholding in EDF this year, Prime Minister Edouard Philippe said in November. A change in EDF’s structure could “shield” its nuclear facilities from the stock market, and that could entail a nationalization of those atomic assets, Ecology Minister Francois de Rugy said in December. The cost of building a new reactor has increased, with the price tag for the delayed Flamanville plant rising to almost 11 billion euros. EDF has been forced to sell 10 billion euros of assets in recent years to help fund investments keep a lid on debt. In 2017, it also proceeded to a 4 billion euro capital increase in 2017 to cope with falling power prices.